Moyna Chitrakar learnt to draw and sing from her mother Gauri Chitrakar. Years later, she illustrated the New York Times Best Seller, Sita’s Ramayana, published by Tara Books, narrating the Patua artists’ version to the world. 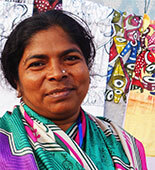 She had earlier assisted her husband Joydeb Chitrakar in illustrating Tsunami (2009), a 12 page graphic scroll-book on the devastating catastrophic tsunami that hit the country in 2004. Interestingly, the couple has also worked on a book, The Enduring Ark based on the story of Noah’s Ark, from the Bible. Both were published by Tara Books.